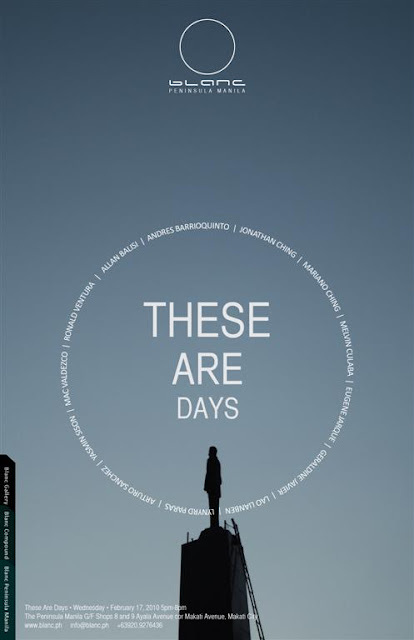 Blanc Peninsula Manila will open with an inaugural exhibition entitled "These Are Days" on Wednesday, February 17 from 5PM until 8PM. The gallery is located at The Peninsula Manila G/F Shops 8 and 9 Ayala Avenue cor Makati Avenue, Makati City. The exhibition will run until March 12, 2010. For more information please visit www.blanc.ph. Call/Sms +63920.9276436. Allan Balisi, Andres Barrioquinto, Jonathan Ching, Mariano Ching, Melvin Culaba, Eugene Jarque, Geraldine Javier, Lao Lianben, Lynyrd Paras, Arturo Sanchez, Yasmin Sison, Mac Valdezco & Ronald Ventura.